It took crews hours an hour and a half to free the 59-year-old driver, who crashed after coming around a corner. 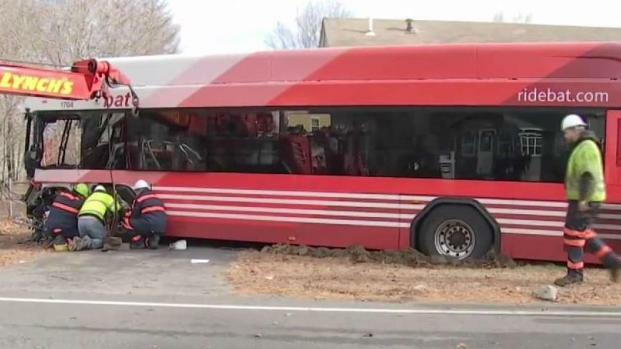 A bus driver was pinned by the vehicle's steering wheel and two others were injured Thursday morning following a serious bus crash in Brockton, Massachusetts. Brockton firefighters scrambled to free the 59-year-old driver who was screaming in pain. "She was just screaming at the top of her lungs in pain cause you know you stuck there and can't do nothing," Uta Calcano said. The crash was reported just before 9 a.m. on East Street. NBC10 Boston's Sky Ranger helicopter captured video of a bus on the front lawn of a home. Multiple fire crews could be seen responding to the crash. The Brockton Area Transit Authority bus went off the road, just missed a house and then slammed into a tree. "I just heard a big boom and then I look out to my window and I saw the water was up in the air," Millicent Henry said. The bus also ran over a fire hydrant sending water more than 10 feet in the air. Neighbors pushed open the doors where they found two passengers on the floor and the driver stuck. "She was stuck with the wheel on her belly. I helped to turn the chair back, but her feet were stuck," Celestina Moreno said. Her foot was wrapped in sheet metal shaved off from the collision. 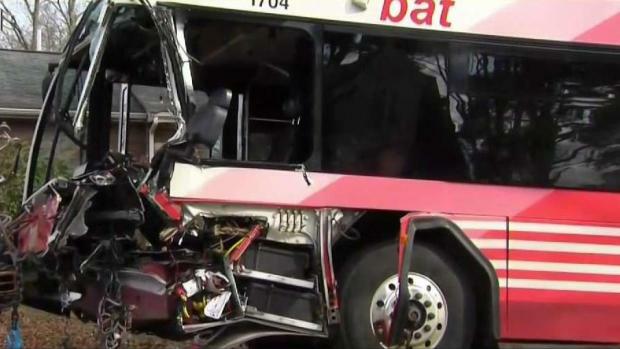 Witnesses describe a bus crash in Brockton, Massachusetts that pinned a 59-year-old driver under the steering wheel and injured two passengers. Firefighters had to cut her out using everything they had. "She was trapped in probably the worst place you could be trapped in that bus in the very corner, and her foot was stuck in that corner of that bus," a Brockton fire official said. It took crews an hour and a half to get the woman from the driver's seat to a stretcher. She was then taken by a medical helicopter to a local hospital with what appear to be non-life threatening injuries, officials said. Three people in total were injured in the crash. Two passengers were on board the bus at the time and were taken to a local hospital with non-life threatening injuries. If a camera on the bus was recording, it may help investigators figure out why this happened. "She wasn't chasing nothing. Nobody was messing with her. She was coming around the corner like the bat bus does every morning. So I don't know what went down with her," Calcano said. 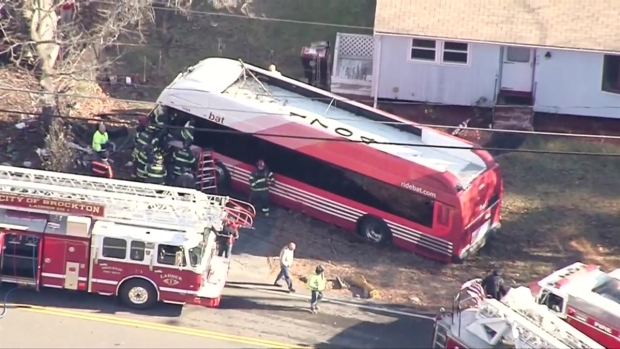 Aerials Show Serious Bus Crash in Brockton, Mass. 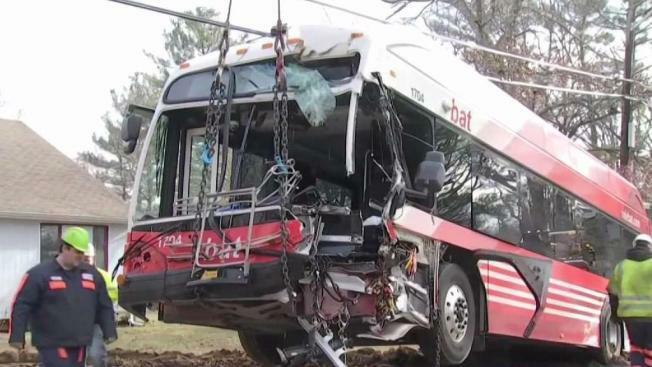 At least one person was airlifted to a hospital after a bus crash in Brockton, Massachusetts caused them to become trapped. The bus has since been towed from the scene. Details on what may have caused the crash were not immediately clear. The crash remains under investigation.